Adjust the Sriracha to your taste. We really like the contrast of the sweet of the honey, the salt of the soy sauce, and the heat of the Sriracha. 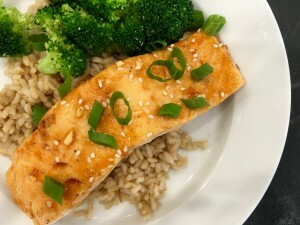 I served this salmon with brown rice and some steamed broccoli. Mix marinade ingredients in a medium size bowl. Reserve ⅓ of the marinade for the cooked fish. Add salmon to the marinade and allow it to marinate in the refrigerator for up to an hour. If you don’t have time, you can skip this step and just cook the salmon right away. Place salmon on a baking sheet lined with parchment paper, and bake at400° F for about 12 – 14 minutes, or until it’s firm to the touch. After 10 minutes, brush the salmon fillets with the other ⅓ of the marinade and turn up the oven to broil. Cook for another 2-4 minutes. Top with sesame seeds and green onions. Serve salmon warm over rice. Copyright © 2016 Our Everyday Dinners - This is an easy recipe for how to make Honey Sriracha Salmon.